The North America market for aesthetic services has been experiencing a tremendous increase in its size and valuation. The increasing aesthetic consciousness and the growing interest of people towards self-grooming in this region are the key factors behind the growth of this market. Apart from this, the alarming rise in the obese population and, consequently, increased demand for liposuction procedure are also boosting this market substantially. Going forward, the growing awareness pertaining to skin rejuvenation, increasing per capita income, and the rising preference for minimally invasive surgical procedures are likely to drive this market substantially over the forthcoming years. However, the lack of an appropriate reimbursement scenario may obstruct the growth trajectory of this market in the near future. 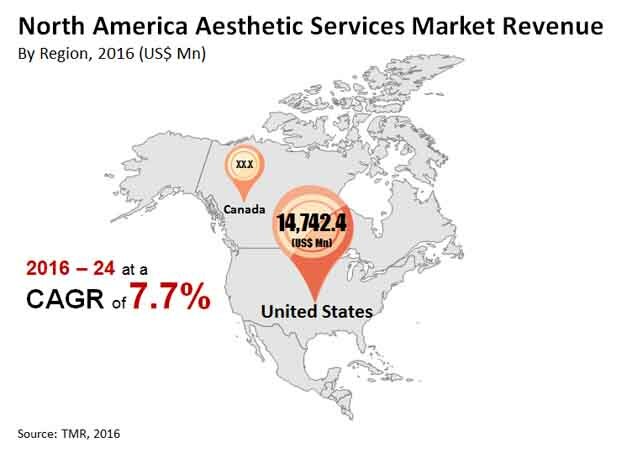 In 2015, the North America aesthetic services market presented an opportunity worth US$14.4 bn. Swelling at a CAGR of 7.70% between 2016 and 2024, the market is likely to attain a value of US$28.1 bn by the end of 2024. Hospitals, ambulatory surgery centers, and dermatology clinics and cosmetic centers have surfaced as the main end users of aesthetic services in North America. Among these, the demand for these services from dermatology clinics and cosmetic centers is greater than other end users. Expanding at a CAGR of 8.60% during the period from 2016 to 2024, the demand from this end-use segment is expected to continue to lead over the next few years. On a similar note, the demand from ambulatory surgery centers is also projected to increase significantly in the near future, thanks to the growing popularity of ambulatory surgery centers as a favorable setting for facial and scar treatments. On the basis of geography, the North America market for aesthetic services is categorized into the U.S. and Canada. With a share of 95%, the U.S. led the overall market in 2015. Analysts project the U.S. market for aesthetic services to continue its leading streak over the forthcoming years. The increasing awareness among consumers in the U.S. pertaining to aesthetic services, coupled with the improvement in the medical and healthcare infrastructure and the growing prevalence of skin diseases, is likely to boost this domestic market in the years to come. Apart from this, the increasing demand for aesthetic treatments from the male population and the easy availability of user-friendly aesthetic devices are also expected to fuel the growth of this market in the U.S in the near future. At the forefront of the North America aesthetic services market are Advanced Dermatology and Cosmetic Surgery, Dermatology solutions group, Riverchase Dermatology and Cosmetic Surgery, The Plastic Surgery Clinic, The MedSpa Southwest Plastic Surgery, Cosmetic & Aesthetic Plastic Surgery Clinic, Toronto, Riverside Plastic Surgery, DCDermDocs, Marina Plastic Surgery, and Quatela Center for Plastic Surgery. Growing awareness about skin rejuvenation, expanding per capita income and the shift towards minimally invasive and non-invasive procedures are the major drivers propelling the growth of North America aesthetic services market. Lifestyle changes along with changes in eating habits leads to increase in obesity, which causes accumulation of excessive fat and cholesterol, resulting in increase in body weight. Obesity is a substantial problem in America that affects large number of people. Rising incidences of obesity are increasing adoption of liposuction procedure. The report is a combination of primary and secondary research. Primary research formed the bulk of our research efforts, with information collected from telephonic interviews and interactions via e-mail. Secondary research involved study of company websites, annual reports, press releases, stock analysis presentations, and various national and international databases. The report provides market size in terms of US$ Mn for each segment for the period from 2016 to 2024, considering the macro and micro-environmental factors. Growth rates for each segment within the aesthetic services market have been determined after a thorough analysis of past trends, demographics, future trends, technological developments and reimbursement scenario. The market overview section of the report includes qualitative analysis of the overall aesthetic services market including the determining factors and market dynamics such as drivers, restraints, market trends and opportunities, along with potential customer analysis, PEST analysis, top five services by countries, supply demand analysis and market entry opportunity analysis. In addition, market attractiveness analysis by country, services type and end-user along with strategies adopted by key players have been provided which explain the intensity of competition in the market considering different geographical locations. The competitive scenario between market players has been evaluated through market share analysis. These factors would help the market players take strategic decisions in order to strengthen their positions and increase their shares in the market. Pricing of services offered holds a crucial part of the report, which further describes the cost applicable to customer in both countries. Based on the end user, Dermatology clinics and cosmetic centers is the most attractive end-user segment of the aesthetic services market. The segment is projected to register a CAGR of 8.6% from 2016 to 2024. Ambulatory Surgery Centers is expected to be the next most lucrative End-user segment and anticipated to expand at the rate of 7.3% during the forecast period. ASCs are the preferred settings for aesthetic treatments, especially facial and scar treatments. Geographically, North America aesthetic services market has been categorized into The U.S. and Canada. The U.S. was the most attractive market in 2015. The U.S. accounted for 95% share of the North America aesthetic services market in 2015 and is projected to expand at CAGR of 7.9% during the forecast period of 2016-2024. Rising awareness and adoption of various aesthetic services, growing health care infrastructure, rising incidence of skin disorders are anticipated to boost the growth of the market in the region during the forecast period. Further increasing demand for aesthetic treatments among the male population and availability of user friendly aesthetic devices are the key factors fuelling the growth of aesthetics services market in near future. Major aesthetic service providers operating in North America aesthetic services market are Advanced Dermatology and Cosmetic Surgery, Riverchase Dermatology and Cosmetic Surgery, Dermatology solutions group, The Plastic Surgery Clinic, Cosmetic & Aesthetic Plastic Surgery Clinic Toronto, The MedSpa Southwest Plastic Surgery, Riverside Plastic Surgery, Marina Plastic Surgery, DCDermDocs, Quatela Center for Plastic Surgery.